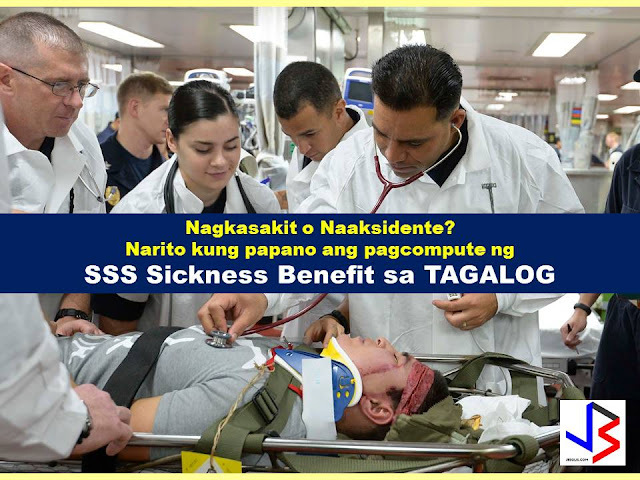 SSS members who become sick can claim for sickness benefits. However, the sickness benefit may vary depending on the monthly contribution of the member. For your guide on SSS sickness benefit claim, you may refer to the information and example below. 1. Exclude the semester of sickness. -A quarter refers to three consecutive months ending March, June, September or December. -A semester refers to two consecutive quarters ending in the quarter of sickness. Example: An SSS member got sick for 20 days on the month of September 2012. The quarter of sickness will include the months of July, August and September. And the semester of sickness will be from April 2012 to September 2012. The semester of sickness will be excluded in the computation. 2. Count 12 months backwards starting from the month immediately before the semester of sickness. 3. Identify the six (6) highest MSCs within the 12-month period. Monthly salary credit (MSC) means the compensation base for contributions and benefits related to the total earnings for the month. Monthly salary credit salary credit means the compensation base for contributions and benefits related to the total earnings for the month. 4. Add the six (6) highest MSCs to get the total MSC. 5. Divide the total MSC by 180 days to get the ADSC. 6. Multiply the ADSC by ninety percent (90%) to get the daily sickness allowance. 7. Multiply the daily sickness allowance by the approved number of days to arrive at the amount of benefit due. With our example the daily sickness allowance is P 450. Juan will be receiving P 9,000 worth of sickness benefit. How many days in a year can a member avail of the sickness benefit? A member can be granted sickness benefit for a maximum of 120 days in one (1) calendar year. Any unused portion of the allowable 120 days sickness benefit cannot be carried forward nor added to the total number of allowed compensable days for the following year. The sickness benefit shall be paid for not more than 240 days on account of the same illness. If the sickness or injury still persists after 240 days, the claim will be considered a disability claim.